Silver is one of the basic elements with the chemical symbol Ag from the Latin argentum. Silver is a precious metal used in jewelry, coins and many industrial uses. Many nations have used silver as their basic unit of monetary value. Silver can be alloyed with copper, zinc and other metals. The U.S. used silver in general circulating coins until 1964 and produced the last circulating silver coin in 1969. The U.S. Mint issues a one troy oz. .999 fine silver coin, the silver eagle, with a one dollar face value. The Royal Canadian Mint issues a one troy oz. .9999 fine silver coin, the silver maple leaf, with a five dollar face value. Australia, Austria, China, Mexico and Great Britian also mint bullion silver coins. Silver has been used as money for centuries. In many languages around the world, silver and money are the same word. Recorded use of silver to prevent infection dates to ancient Greece and Rome; it was rediscovered in the Middle Ages, when it was used for several purposes, such as to disinfect water and food during storage, and also for the treatment of burns and wounds as wound dressing. In the 19th century, sailors on long ocean voyages would put silver coins in barrels of water and wine to keep the liquid potable. Precious metals are traded all over the world, from New York and London to Hong Kong and Shanghai. The silver market is like most, subject to supply and demand. The supply is limited and requires expensive mining and refining or recycle of existing silver. The demand comes from industry, jewelry and investment. The price of silver changes as market conditions change. This includes many factors including world economic activity. The price in the USA is expressed in US dollars per troy ounce. From 1990 to 2003, the price of silver was between $4 to $6 per ounce. The average silver price in 2003 was $4.85 per ounce. 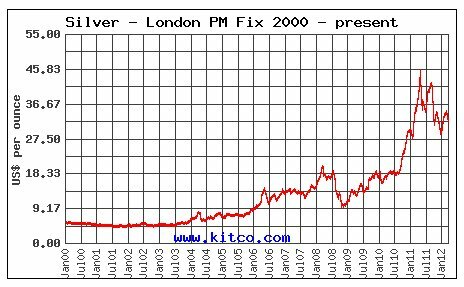 In 2006, the silver price experienced a 58% increase over the average 2005 price of $7.31 per ounce. 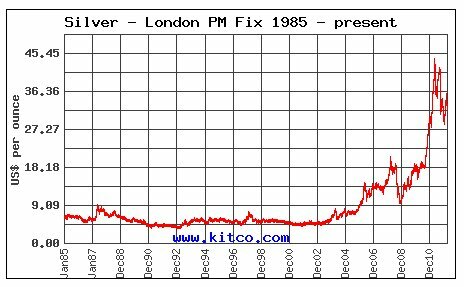 The silver price reached levels not seen in 26 years. The primary factor driving the stronger silver price was the continued strength of investment demand. Much of the investment demand can be attributed to the launch of Barclays’ Global Investors iShares "Silver Trust" Exchange Traded Fund (ETF), (SLV sitcker symbol) which was introduced in late April 2006. Silver posted an average price of $14.67 in 2009. Silver posted an average price of $20.19 in 2010. In 2011, silver rose to over $45 per ounce before correcting to around $30 per ounce at years end. London Fix is the price per ounce of silver set by three market making members of the London Bullion Market Association at approximately 12:00 noon, London time, on each working day. When you buy silver bullion coins or bars, you pay the current spot price plus an extra premium which is the dealers charge for the transaction. The premium varies dealer to dealer and also from coin to coin. Bars usually sell for less premium than coins. Part of the premium is the dealers profit. Silver bullion has no collector value, so you do not pay extra collector market value for coins. If you are going to buy a large amount of silver, the premium becomes a concern. A dealer who charges more than $4 over spot is ripping you off. A good dealer will usually charge $2.50 to $3.50 over the current spot price for a one oz. bullion coin such as the silver eagle. Where you buy silver bullion is very important. You want to buy from a known dealer so you don't buy a fake coin or bar. All kinds of tricks are used to fake the metal content. There are hundreds of reliable well known coin dealers so don't buy from an unknown source. Do some research online. Check out the dealer before buying. Ask about the methods to verify the silver coin such as weighing the coin to make sure it is real. Coins with a collector value are referred to as numismatic coins because they are rare or desirable beyond their silver content. 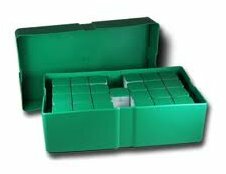 These silver coins are graded on a scale which identifies the coins quality. The grades have evolved over time from used and new to grades of good, fine, very fine up to BU (brilliant uncirculated). The MS description refers to "mint state" for uncirculated coins and are graded from MS60 to MS70 with MS70 being a perfect coin. Professional Coin Grading Service (PCGS) is a third party authentication and grading service for rare coins. PCGS was originally started by seven coin dealers in 1985 to standardize coin grading. PCGS and its competitors play a key role in rare coin markets as a supplementary quality analysis provider for collectors in assessing the quality of particular coins. Even small differences in coin quality can result in dramatic differences in market pricing. In March 2010 PCGS announced its Secure Plus service, which digitally takes a unique "fingerprint" of each coin and enters it into a permanent database. The Coinage Act of 1792 established the framework for the coins used in the USA. The U.S. coins for circulation with silver content include dollar, half-dollar, quarter and dime coins, however, since 1965 with few exceptions, silver is no longer included in coins in circulation. Coins today for circulation are copper with nickel exteriors. Only the silver eagle bullion coin and some proof sets are being minted with silver content. The Morgan Dollar is one of the most collected silver coins in U.S. history. First produced in 1878. Both the Morgan and the Peace silver dollars have an eagle on the reverse side but the Morgan's eagle has spread wings while the Peace's eagle has folded wings. The largest and heaviest silver coin since the Civil War, the Morgan silver dollar contains 0.77344 ounces of pure silver. It was minted continuously from 1878 to 1904 when the government exhausted its supply of silver bullion. 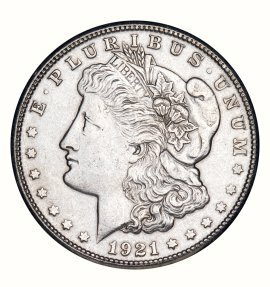 Congress would pass the Pittman Act in 1918, recalling over 270 million silver dollars for melting and the Morgan dollar would be minted one last year in 1921 before being replaced by the Peace Silver Dollar. The Peace Dollar was minted to commemorate the signing of the peace treaty between the United States and Germany at the end of World War I. All Peace Silver Dollars were struck in high relief in 1921, their first year of production. The design was slightly modified in 1922 and normal relief coins were struck later that year. Peace Dollars were struck continuously until the effects of the Great Depression were felt in 1929. 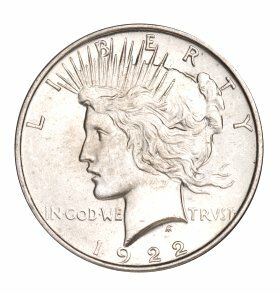 The U.S. Mint began producing the Peace Dollar again in 1934, but coins dated 1935 would be the last to see circulation. The Eisenhower Dollar followed the Peace Dollar and is named for General of the Army and President Dwight David Eisenhower, who appears on the obverse. Both the obverse and the reverse of the coin were designed by Frank Gasparro. The Eisenhower Dollar is a $1 coin issued by the United States government from 1971–1978. 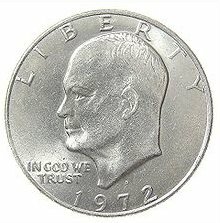 The Eisenhower dollar was the last dollar coin to contain a proportional amount of base metal to lower denominations; it has the same amount of copper-nickel as two Kennedy half dollars, four Washington Quarters, or ten Roosevelt dimes. Because of this it was a heavy and somewhat inconvenient coin. It was often saved as a memento of Eisenhower and never saw much circulation. This led to its short time in circulation and its replacement by the smaller, but even less popular, Susan B. Anthony dollar in 1979. The Eisenhower Dollar was struck with a copper-nickel composition for circulation and was the first United States dollar coin to not be struck in a precious metal, although special collectors' issues were struck at the San Francisco Mint in a silver-copper composition the same as the 1965-70 Kennedy half dollar. Some Eisenhower Dollars were minted in a 40% silver clad to be sold to collectors. All of these coins were minted at the San Francisco Mint, with dates 1971, 1972, 1973, 1974, and 1776-1976. Coins minted in 1975 and 1976, all dated 1776-1976 for the Bicentennial, come in packaging with the similarly dated quarter and half dollar of that brief series. 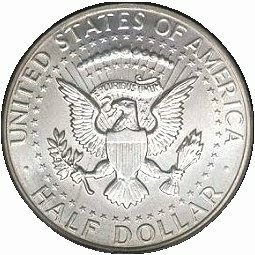 The Walking Liberty Half Dollar is a silver half dollar coin issued by the United States government, equal to fifty cents. Walking Liberties were minted from 1916 to 1947. 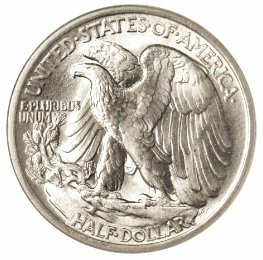 The Walking Liberty half dollar obverse (front) is considered one of the best designed silver coins in American coinage. 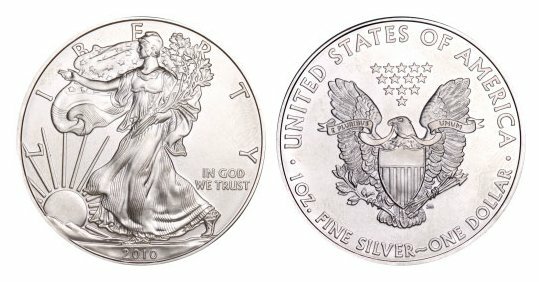 As a result, the obverse design was used for the American Silver Eagle bullion coin. Each Walking Liberty, as did the Franklin and the Kennedy half-dollar, contained 0.36169 oz pure silver when minted. A junk silver bag ($1,000 face) of circulated half-dollars weights right at 55 pounds. Because half-dollars suffered less wear than dimes and quarters, a junk silver bag ($1,000 face) of half-dollars will net 718-720 ounces of silver if smelted, whereas a bag of dimes or quarters will net about 715 ounces. This is one reason half-dollars carry higher premiums than dimes and quarters. The Franklin half dollar is a coin struck by the United States Mint from 1948 to 1963. The fifty-cent piece pictures Founding Father Benjamin Franklin on the obverse and the Liberty Bell on the reverse. 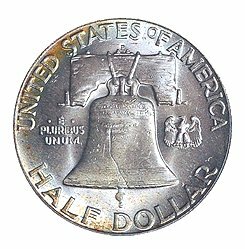 A small eagle was placed to the right of the bell to fulfill the legal requirement that half dollars depict the figure of an eagle. Produced in 90 percent silver with a reeded edge, the coin was struck at the Philadelphia, Denver, and San Francisco mints. 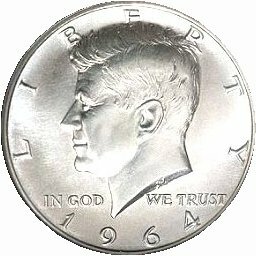 Beginning in 1964 it was replaced by the Kennedy half dollar. Starting with 1965-dated pieces, the percentage of fine silver was reduced from 90% to 40%. In 1971, silver was eliminated entirely from the coins. Since 2002, Kennedy half dollars have only been struck to satisfy the demand from collectors, and are available through the Mint. The U.S. quarter dollar is one of the most popular and most used coins in circulation. The Washington quarter has been in circulation from 1932 until the present day. In 1932 the Washington Quarter made its debut, replacing the former Standing Liberty Quarter design. A change in metal composition from 90% silver to 75% copper clad in 25% nickel starting in 1965. Not until 1992-S, in special proof sets, did the 90% silver Washington Quarter reappear. In 1999 the State quarter reverse design began. Five states per year were released. But this did not end in 2008 when the last states were issued. American territories and in 2010, the U.S. national parks continue the trend. Non-clad silver quarters weigh 6.25 grams and are composed of 90% silver, 10% copper, with a total silver weight of .18084 oz pure silver. They were issued from 1932 through 1964. The dime is a coin 10 cents, one tenth of a United States dollar. The dime is the smallest in diameter and is the thinnest of all U.S. coins currently minted for circulation. The term dime comes from old French "disme" meaning "tithe" or "tenth part", from the Latin decima. From 1796 to 1837, dimes were composed of 89.24 percent silver and 10.76 percent copper. With the passage of the Coinage Act of 1965, the dime's silver content was removed. Dimes from 1965 to the present are composed of outer layers of 75 percent copper and 25 percent nickel, bonded to a pure copper core. Starting in 1992, the U.S. Mint reintroduced silver coins in its annual collectors sets. This included a 90 percent silver proof Roosevelt Dime, Washington Quarter(s) and Kennedy Half Dollar, a series that continues today. 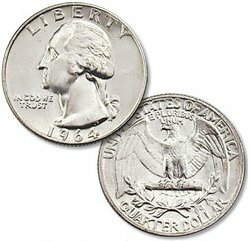 Until 1965, U.S. coins, dimes, quarters, half-dollars, were made of 90% silver. 1964 was the last year that coins were made of 90% silver and 10% copper. These pre-1965 coins are often referred to as "Junk Silver". You can buy these coins in a "bag" which contains a specified amount of face value silver coins and can be a mixture of dimes, quarters and half dollars all containing 90% silver. A "bag" in the common usage refers to $1000 face value in silver coins. These bags do NOT sell for $1000 but for the value of the silver. For this example we will use $28 per oz. 715 * $28 = $20,020 for example. This is for $1000, so $1 in silver coins is worth 1/1000 of this amount which is $20. Dimes come in rolls of 50 with a $5 face value, each $5 roll would be worth $100. Quarters come in rolls of 40 with a $10 face value, each $10 roll would be worth $200. You can purchase rolls or bags of silver coins and if you check the current silver price and use these calculations you can determine what the value is. Another example: $1000 face value bag of all quarters = 4,000 quarters at 0.18084 oz. of silver = 723 oz. at $28 per oz. = $20,254. Half bag $500 face 358 oz., quarter bag $250 face 179 oz., and tenth bag $100 face 72 oz. are also available and you can buy coin by coin. If you want 133 quarters for example, a dealer can count out any value you want. Bullion has no collector value. You just pay for the silver content. Silver bullion coins, bars and rounds are available. The U.S. Mint produces each year the American Silver Eagle bullion coin, a 1 troy oz. coin of .999 fine silver with a face value of one dollar. The Silver Eagle dollar was first released by the U.S. Mint on November 24, 1986. It contains one troy ounce of .999 Pure Silver, and has a nominal Face Value of One Dollar. Its weight and content is certified by the U.S. Mint. For coin collectors, the U.S. Mint produces a proof version of the coin. The Silver Eagle dollar has been produced at three minting locations, including Philadelphia (‘P’ mintmark), San Francisco (‘S’ mintmark) which issued proofs, and more recent proofs from West Point. An authentic Silver Eagle dollar will weigh at least 31.103 grams, and its diameter is 40.60 mm, with a thickness of 2.98 mm. Its edge must be reeded, and the Silver content is 99.9%. The obverse design features walking Liberty and is adapted from the design of Adolph A. Weinman during the year 1916. The reverse design features a Heraldic Eagle with Shield, 13 stars, and United States of America on top, which was designed by John Mercanti in 1986. 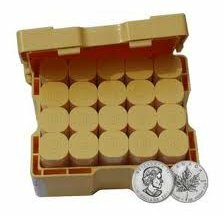 The U.S. Mint sells Silver Eagles in "tubes" 20 coins per tube and "monster" boxes of 25 tubes (500 coins). One tube (20 coins) of silver eagles should weigh roughly 670 grams give or take a few grams depending on the tube's weight and the slight variations in the coins weight. Mintages of Silver Eagles has been from about 4 million to 10 million per year from 1986 until 2007, with 1996 being the lowest at 3.6 million, but starting in 2008, mintages have increased dramatically to 20 million, then 29 million in 2009 and almost 35 million in 2010. In 2011 39,868,500 silver eagles, just under 40 million, were sold according to the U.S. Mint. Bars are an alternative to coins. Bars are typically available in 1 oz., 10 oz., and 100 oz. .999 fine silver. 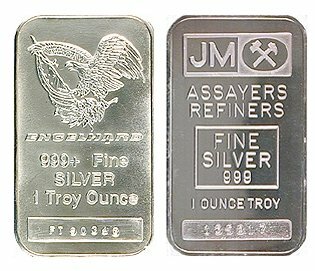 Bars of silver are produced by refiners and bear the name of the refiner. Reputable refiners include Engelhard, Johnson Matthey, Pan American Silver Corp., Westminster Mint, Sunshine Mint, Northwest Territorial Mint, and A-Mark. The public demand for physical silver product started in the early 1970s. By the mid to late-1970s, Johnson Matthey and Engelhard dominated the market. The premium over spot silver is slightly lower for 1-oz silver bars than for 1-oz silver coins (Canadian Maple leaf silver coins or American Silver Eagle coins) or for 1-oz silver rounds like Engelhard Prospectors. 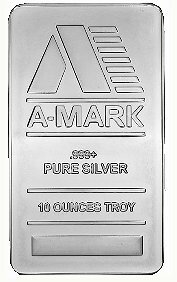 You can buy 1-oz silver bars on Ebay, Amazon or from online precious metals dealers. Also COMEX, APMEX and MONEX. Silver bullion bars are a popular way to buy silver. Engelhard silver bullion products are the best-known brand in the industry. Engelhard was one of the world’s largest refiners of precious metals before being purchased by BASF in 1986. Since these bars have not been issued since the 1980’s the only way to buy them is in the secondary market. Each bar is hallmarked stamped for weight and purity. Silver rounds contain one ounce of .999 fine (99.9% pure) silver. Among the most popular and well-known 1-oz silver rounds presently being minted are those carrying the names of Sunshine Minting and A-Mark Precious Metals. Other 1oz silver rounds, but without the mints' names, are the Buffalo/Indian Head silver rounds and the Standing Liberty silver rounds. 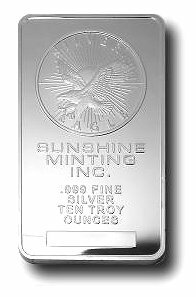 Sunshine silver rounds are popular because they are usually readily available, and the name Sunshine is nearly synomomous with silver because of the famed Sunshine silver mine in Coeur d'Alene, Idaho. Sunshine silver rounds are sometimes called silver eagle rounds because the front depicts an eagle flying through the sun. However, in the silver bullion community, the term Silver Eagles is reserved for the U.S. Mint's American Eagle silver coins. A-mark silver rounds have been manufactured since 1983 and sometimes show up in the secondary market. However, most A-mark silver rounds now available are new, 20 coins to a tube. A-mark silver rounds carry an image of the Liberty Bell on one side and an image of an eagle on the other. They are clearly marked 1-oz .999 silver. Buffalo/Indian Head silver rounds are relatively new but are widely accepted because of their design: the legendary U.S. Buffalo/Indian Head nickel, which was minted 1913-1937. Across the top on the back is UNITED STATES OF AMERICA. However, the coins are privately-minted. The classic Augustus Saint-Gaudens' Standing Liberty, which graces the beautiful $20 Double Eagle gold coins (1908-1933) known as the Saint-Gaudens, stands proudly on the Standing Liberty silver rounds. The reverse carries an image of a magnificent gold eagle. Generic silver rounds refers to 1-oz .999 silver rounds that generally are not identified by their names. With the silver bullion industry now in its fourth decade, many silver rounds fall into the category of generic silver rounds. 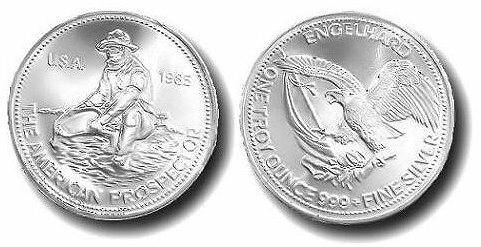 From 1975 to 1988, Engelhard produced 1-oz Prospector silver rounds. The Prospector silver rounds were so named because the obverse of the round bears the image of a prospector panning for gold. Because of their high quality and the name Engelhard, Prospector silver rounds have remained extremely popular with silver investors. Engelhard Prospectors are no longer made and are available only when investors sell into the secondary market, which is not often. When Prospector silver rounds are available at only slightly higher prices than other silver rounds, buy them. In the mid-1980s, Johnson Matthey, a company in the precious metals industry as respected as Engelhard, minted Freedom Rounds, so named because they celebrated the first ten amendments to the U.S. Constitution, known to all Americans as the Bill of Rights. 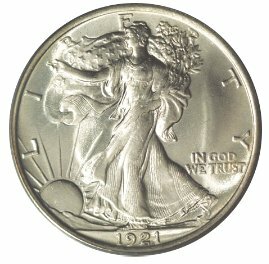 Freedom silver rounds are excellent pieces and should be acquired when available; however, few were made, and they rarely show up in the secondary market. Johnson Matthey Freedom silver rounds and Engelhard Prospector silver rounds carry about the same premiums. When originally manufactured, Johnson Matthey Freedom silver rounds came in Mylar sheets of twenty. When they show up in the secondary market, sometimes they are still in the original Mylar packaging. Question: What percent of my net worth should I invest in precious metals? Answer: That depends on several factors. Every person is different and is in a different situation. If you are young, you have a different perspective than an older person. Your goals could be very different from someone else's goals. Regardless, nobody knows for sure what is going to happen to the world economy in the future. Diversification is the key. By having a stake in many areas you should not lose out big if one area falls. Have some stocks, have some real assets, have some cash, have barter items and have some precious metals. With this thinking, generally speaking about 15% in precious metals is a good guideline. Patience is a large part of your strategy. Little moves over time is better than rash plunges all at once. Remember information is power. The more you know about an area the better decisions you can make. • Omega Precious Metals, Inc.